← “Heyyy, Tooonyyy!” Video Exists. Yeah, yeah, yeah, I know. I missed 2 days of blogging on my blog-a-day goal. In my defense, I was tired and went to bed early, haha. Let me quickly recap what I’ve been up to the past few days. Not that anyone is interested, but that’s life. Jay got back from his training in Virginia on Friday afternoon. I met up with my friend/old-coworker Cara for Happy Hour on Friday to trade work stories and get the gossip I’ve been missing out on the past month. [Side note: I cannot believe it’s only been a month since I started my new job.] After some fine martinis with Cara, Jay & I went from one North Hills restaurant to another (he met up with me as we were finishing up) for dinner. Note to self: Pasta & wine don’t taste the same after a dirty martini. Should’ve gotten a salad and another martini, lol. Oh, the sodium-filled weekend I had! On Saturday, I hit up the gym while Jay worked all day. I then pretty much spent most of the day running errands and watching a Psych marathon on Ion while “cleaning.” Jay came home for lunch a little while after I got back from the gym. Since parking is nutso at the mall on Saturdays, I dropped him back off at work before I ran my errands. After I picked him up, we debated going out to eat again, but remembered we had leftovers from the night before and opted for those (the cheaper option, lol) instead. OH YEAH! Last week, I happened to stumble upon something awesome that I didn’t know existed: 40’s of Samuel Adams Summer Ale!!! I was SO EXCITED to find them since despite it being only AUGUST, the fall seasonal, Octoberfest, is already out. I didn’t think I’d find Summer Ale anywhere anymore. We drank those while watching more Psych. It was a fun, quiet night. On Sunday, Jay was off from work, but the weather was awful. It was pouring rain outside. Jay & Clif played raquetball at noon, so I tagged along to watch them. I did approximately 10 minutes of working out before I admitted to myself that I just wasn’t feeling it. 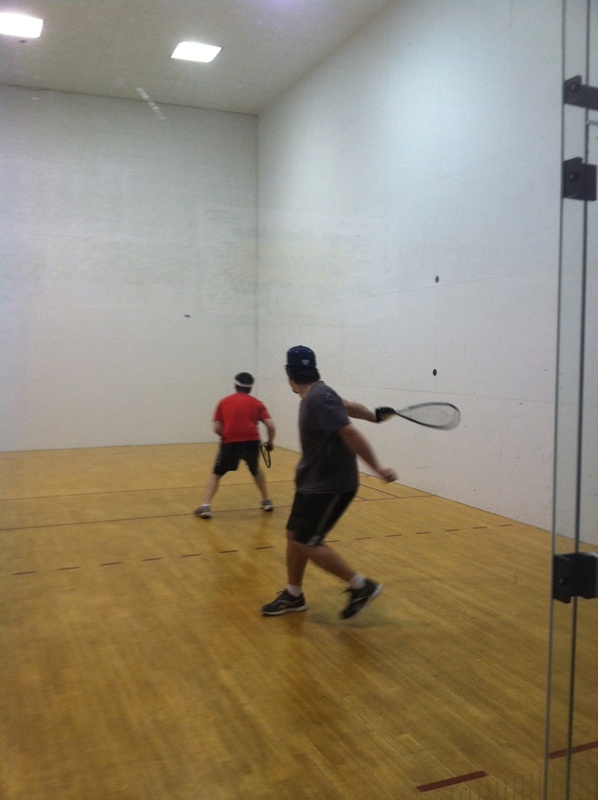 I had a good time watching them have a good time playing raquetball. Jay & I went out for smoothies afterwards and I made the mistake of taking a 2 ounce shot of wheatgrass with my smoothie. Since my body is still in the detoxifying stage from the wheatgrass, that was a recipe for nausea. Wheatgrass doesn’t always get along with other foods, so they recommend you not eat for an hour after taking it. About an hour after taking it is when I turned white and needed to lay down. We laid low for the afternoon, watching the first Pirates of the Caribbean movie before heading over to Jay’s parents’ house for dinner. I was feeling much better by then. Jay filmed a lot of the time while we were at Disney World back in May. Before he left for Virginia, he cut it all together into an hour-and-twenty-minute-long movie. He “premiered” it for his family after dinner on Sunday. I must say that it’s quite impressive. He did a phenomenal job with it; it captures how much fun we had. I want to design a DVD cover for whenever he burns it to DVD! Technically, my next Summer Day would be this upcoming Friday, August 24, but since Jay was also off on Monday the 20, my boss was cool with me switching the day (you can take off a Monday or a Friday). We really wanted to try to get to the beach this time, but of course, it freaking rained again! I was bummed, but I guess the beach is just not meant to be yet again this year. Sad face. It ended up being nice in Raleigh in the afternoon, so I went for a walk. I was planning on working a bit on my book after my walk, but ended up falling asleep. I laid down on the bed to pet Zoe because she was laying there. She put her paw on top of my arm and then all of a sudden it was 45 minutes later. Oh well, guess I needed the rest. 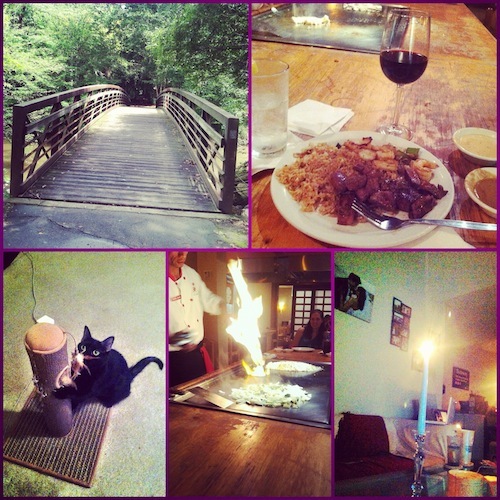 Because I hadn’t had enough sodium from the previous two nights, we went to Kankii (Hibachi is my faaaavoorrittee) for dinner, and then finished up the long weekend by watching TV and hanging out. I’d realized during the day that I must’ve spent $100 on all these Yankee Candles and decorative accessories to put up this summer and have barely lit any of them. So, after dinner I lit them, then turned most of the lights off and we watched TV by candlelight. I must say, the house looked (and smelled) fantastic. Since we had eaten dinner at 5:30pm, we were totally ready to go to sleep by 11:00pm. I think that had to have been one of the best parts of the weekend. I woke up to go to the bathroom at 1:00am and instead of being asleep for 15 minutes, it felt like I’d been asleep for hours. At long last, man, that was a good night’s sleep. We’re going to make an effort to do that more often. This entry was posted in Jay Glatfelter, Married Life, Weekend. Bookmark the permalink.